Promo Value: New & existing user enjoy RM20 off x 2 times for Grab ride, limited to first 1,000 redemption only. Promo Usage: Applicable for Grab new & existing users only, valid to/from No 32-2 Jalan Segambut 51200 Kuala Lumpur, from 9am – 5pm only. Download the Grab app from the Apple App Store and/or Google Play Store. Select preferred icon and tap Next. 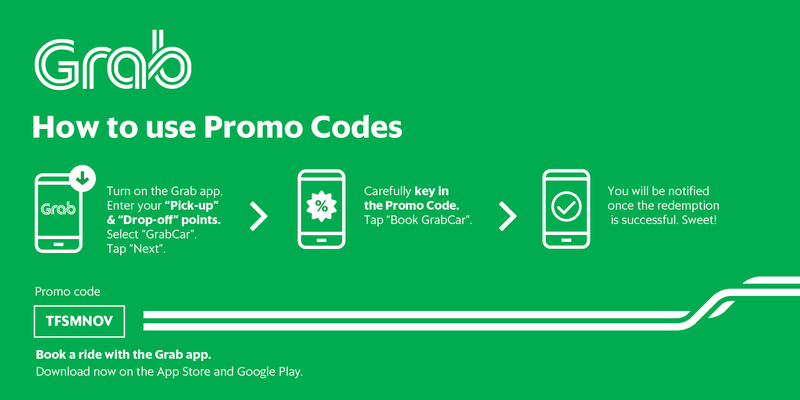 Book a Grab ride to your preferred drop off point with your desired promo code. Have a safe journey with Grab! This promotion is only valid for Grab pick up/drop off from/at Grab Klang Valley coverage area within Malaysia. If the fare is less than the promo amount, there will be no reimbursement of the fare difference. If the fare is more than promo amount, the additional fare amount will be charged to the Grab user. A cancelled booking (either by passenger or driver) nullifies the promo entry. The promotion discount is only successfully redeemed once a relevant in-app and/or SMS message is received (after successfully being allocated a car by the system). All bookings must be made via the Grab (MyTeksi) App. Not valid with other promotions. Not valid for airport trips. Promotion will not be applicable for recycled mobile numbers that were previously registered with MyTeksi. Please contact us at 1300-805-858 if you suspect that this may be the case. All employees (both permanent and fixed term contract) of the Organiser and their immediate family members. By taking part in this campaign, you have indicated that you have read, understood and agreed to be bound by these terms and conditions. You also acknowledge and agree to be legally bound by the terms and conditions below and decisions of the Organiser without limitation or qualification. You further agree that all decisions of the Organiser shall be final and conclusive. The Campaign will run from 1st November to 4th November 2016. The Organiser reserves the sole and absolute right to alter or end the Campaign at any time prior to the expiry of the Campaign Period without giving any prior notice and no compensation in cash or in kind shall be given. Participants can enter the Campaign by downloading the Grab (MyTeksi) mobile application (iOS, Android and/or BlackBerry (Z10 or Q10 and above). Participants are required to include their name, mobile phone number and email address for further communication and verification purposes. Just go to ‘Profile’ to register and activate your Grab account. The Organiser reserves the sole and absolute right to disqualify any participant or reject qualifying participants deemed ineligible (be it under these Terms & Conditions or has engaged in a conduct that the Organiser considers inappropriate or unacceptable). Grab reserves the sole and absolute right to withdraw, amend and/or alter any part of the whole terms and conditions in relation to this Campaign at any time without giving any prior notice to the Customers and the Customers agree to be bound by those changes. Grab’s decisions in any matter in relations to the Campaign shall be final and conclusive. Grab shall not be liable for any claims by the Customers or third-party claims or loses of any nature, including but not limited to, loss of profits, punitive, indirect, special, incidental, or consequential damages or for other damages and any related claims of any nature, including direct, indirect, third-part, consequential or other damages resulting from or in connection with this Campaign. Like Grab? You can help us by telling us how much you love us on FB/Twitter/Instagram and refer our services to your friends.